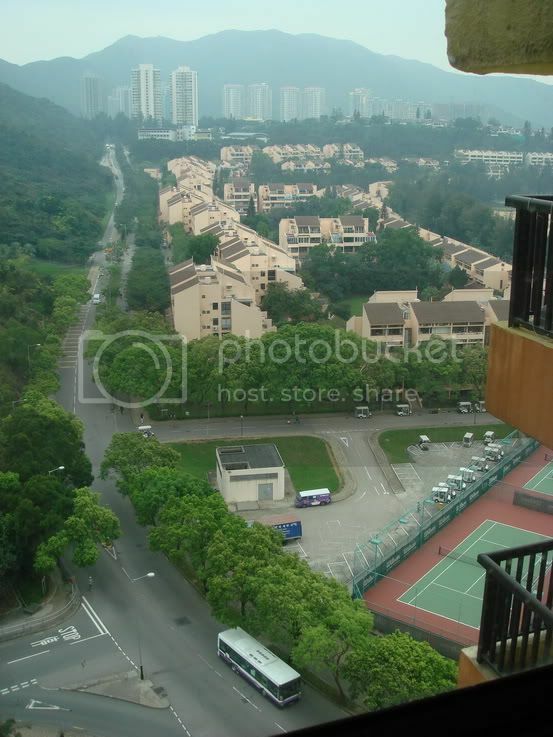 Morning folks, with temperatures of about 15 °C here in Discovery Bay. Looking out my window, hoping to catch a glimpse of an illegal buggy race (which..has never happened yet unfortunately..but would be plenty fun i imagine) I recall that its now 8am on a Friday and everyone else is at work. Now, finally equipped with my sacred cup of coffee (aaaaahh) with the background sound of Mike Rowe & Dirty Jobs to muffle the annoying early morning rythm of jackhammers and drills next door, in addition to the chattering of contractors (who seemed extremely happy with breaking down the walls), I sit at my desk scrolling through the pen reviews board thinking,"hey..why dont I give this a try..?" 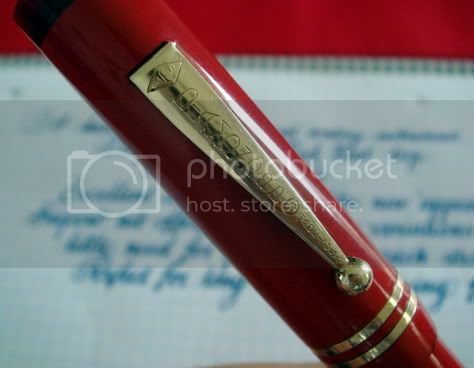 hence inspiring me (or it could be due to the faint smell of paint) to pull out my cam and snap some shots of one of my all time favourite pens in my small inventory..the Diamond Point Pen in Red. 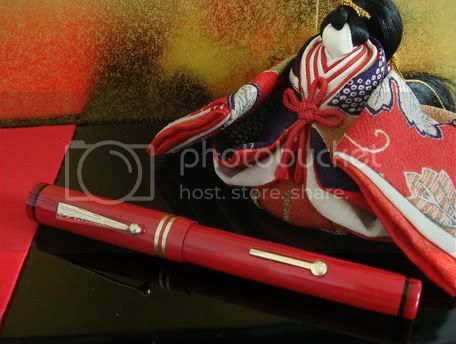 This is in no shape or form a professional review intended to raise the current value of the pen or increase the demand in it's collectability (there are paid professionals for that). This is merely meant to be a fun review where I share MY (the ever so humble amature) opinions of the pen. Purchased some time ago from Marucio Aguilar on his vintagepen.net website, this oversized pen is not as oversized as one would think. Even in my average sized asian hands, it feels remarkably comfortable and has just the right balance to not feel like I'm holding a block of brick. 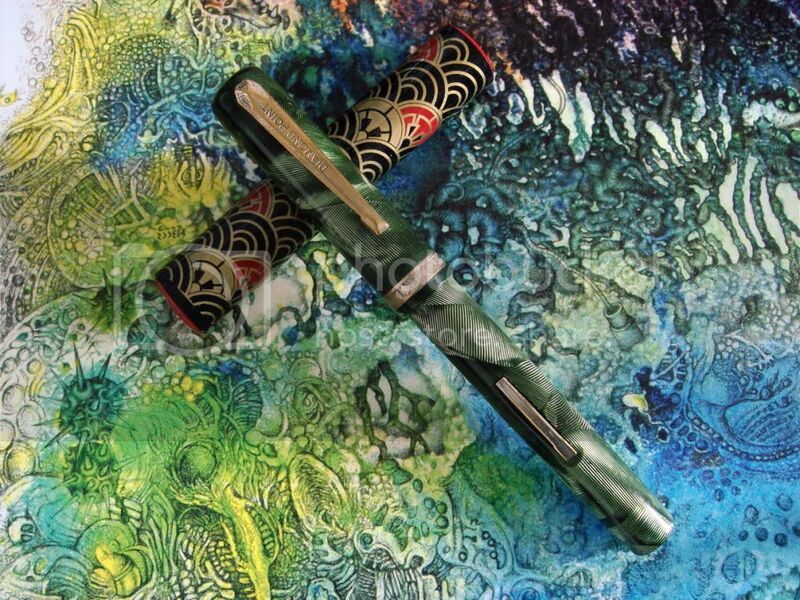 It comes in a variety of striking colours and designs as you can see in his website and I proudly have in my possession, 2 of the oversized pens in Jade Green and Red. 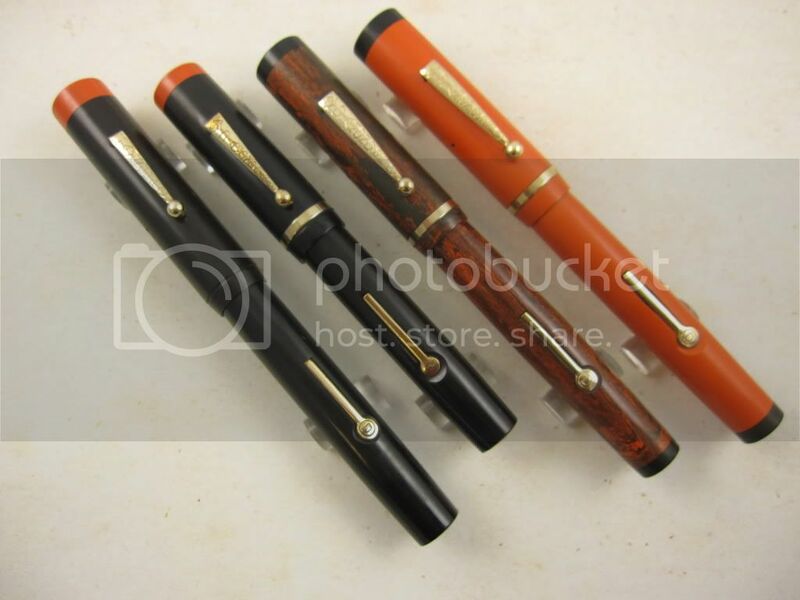 I've not seen many reviews of Diamond Points (one of the reasons why I'm doing this) and only one or two places that offer its history so I'm assuming that it was most likely considered "just one of those vintage pen brands" not widely known by many. This is a pen that will shout out your name and demand your attention. 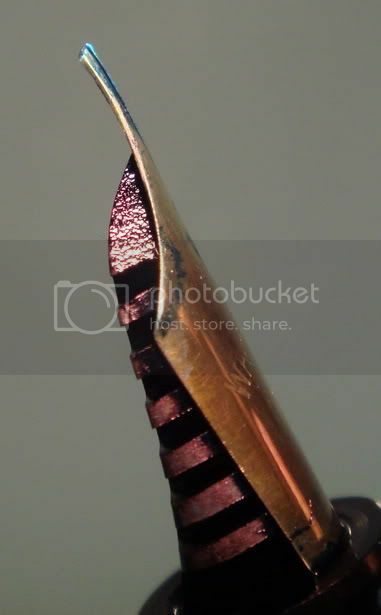 The flat-top cap spots a black ring at the top with a double gold band at the end with the clip proudly bearing it's name. The screw on Cap glides securely on the threads to close it. A winner..a superb, no-nonesense, full flex, warranted 14k #8 that will provide you with hours and hours of flexing fun from Fine to BB with the greatest of ease. Very little pressure needed for the tines to spread. This dangerous combination of a lightweight pen and a flexible nib has been known to cause countless flex addicts to skip meals, cancel appointments and disappear for days at a time (the guilty ones are grinning right now reading this..yeah you!!). 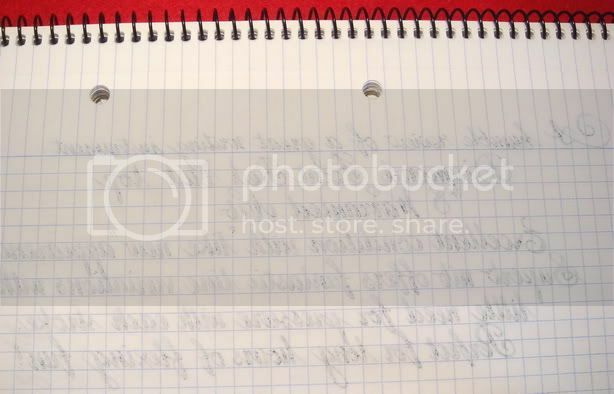 The pictures below taken of the backpage of a no-brand, 5mm squared paper (60g/m2) is evidence that little pressure was applied to the writing sample. Woops ! Looks like I forgot to cross my "T" ! Writing with this is a dream, as it puts down a smooth line (look at the close up shot) and the ink flow consistently keeps up with the spread eagle tines during a downstroke. Lever-filler lets you pump this baby full of ink, and because it's an oversized pen, well - you do the math on just how much ink it can swallow. Like many others out there, I fall within the category of collectors who values a pen more on how well it functions as a writer and how well it lays down a line more so than just the appearence of a piece. I have a rule : if it looks like a lambrogini but drives like a bus, then "OFF WITH HIS HEAD" not litterally, but you get the idea (sorry - just watched Wonderland yesterday). 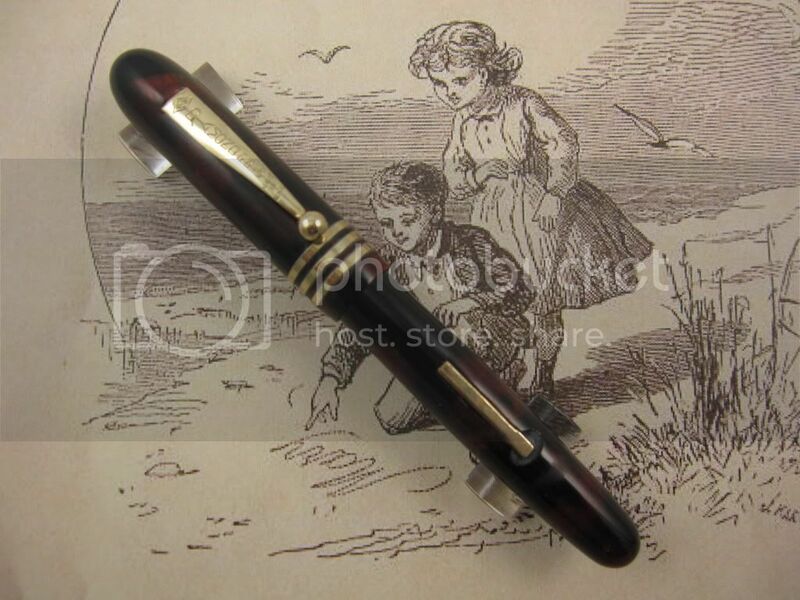 Aces in my book and from the point of view of a humble novice collector like myself, this is a pen of "family heirloom" status..at least of course until my future children discover ebay.. Hands down a truly a remarkable piece of work. Edited by Apotheosis, 12 March 2010 - 06:13. "Oey !! Gimme back my pen !" perfect score... awesome! 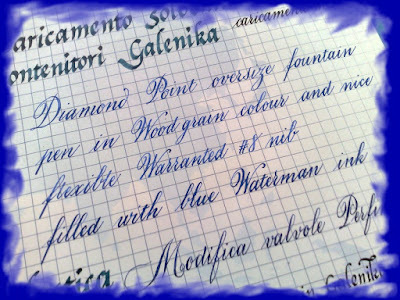 nice review, pix, hand-writing... the works!!! wow! 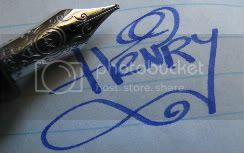 nothing's nicer than your pens except for your handwriting. bravo to your teacher and practice! Nice review and view, thanks. Hello everyone and thanks for reading the review. Although not as professionally done as with a lot of the other previous review posts done by veterans here, I am glad everyone had as much of a fun time reading it as i had coming up with it . Unfortunately I've had no form of formal training, just study references from a couple of books and also from the abundance of samples easily found here on the forum. Was thinking of doing another review soon, but lets see. Edited by Apotheosis, 13 March 2010 - 03:31. Amazing handwriting. If I wasn't so busy at school I'd get a Diamond Point right now. Good review. Loved your handwriting! Great review and great handwriting, Leo! Dude that is sweet ! Now THAT'S a pen in good hands ! Many thanks for your contribution to this review too !! Apotheosis and tipstricks, you guys are such an inspiration! 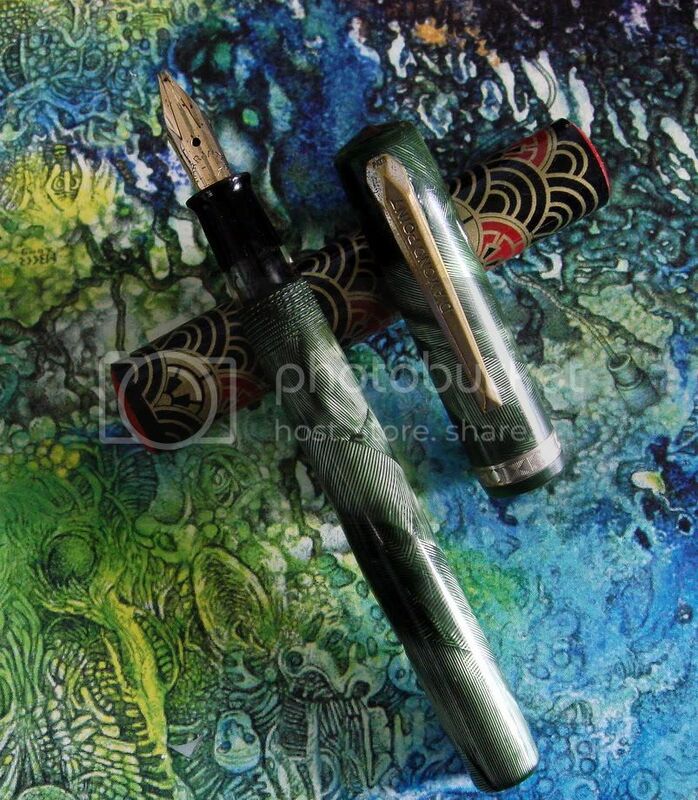 Beautiful work with very nice pens. Thanks for the pictures! What a great review you have done. 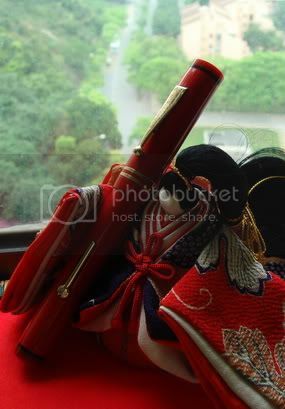 Beautiful pictures and outstanding writing samples for a pen you seem to enjoy a lot and have great control of. You are correct, there is not a lot of information available on Diamond Point pens. 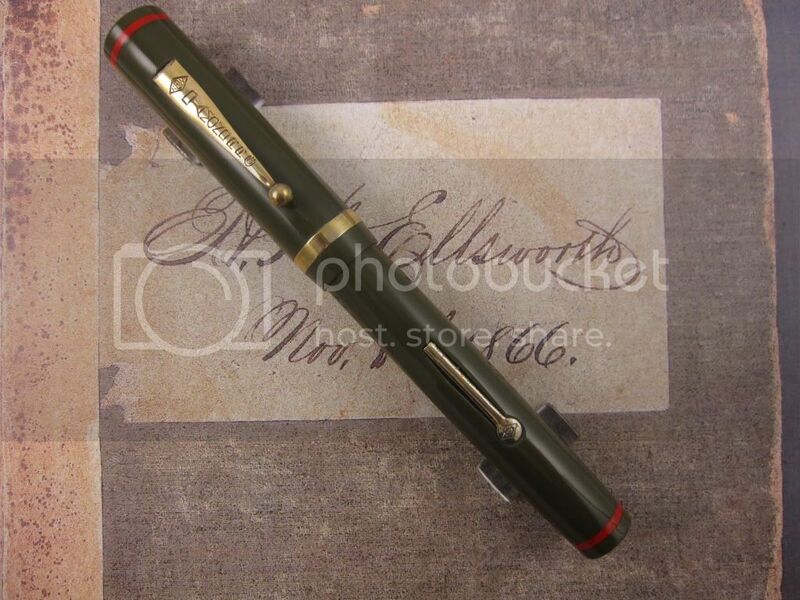 I would like to ask your permission to add a little more historical information to Diamond Points pens and add pictures of some pictures of a few DPs from my personal collection. 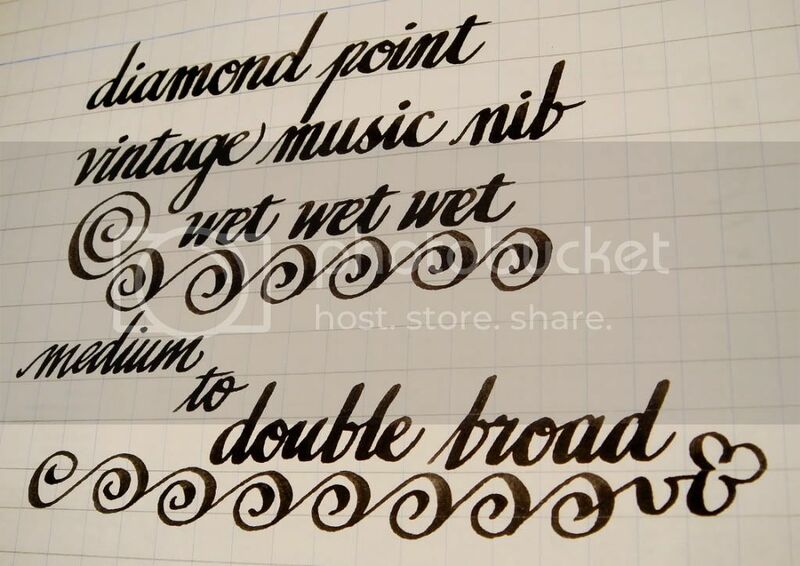 Diamond Point pens are some of my favorite vintage flexy pens. 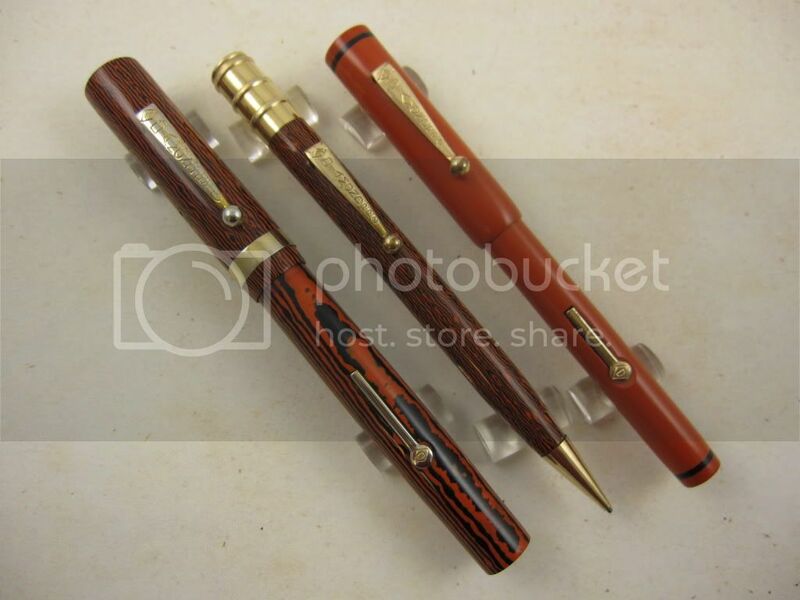 Beautiful styles offered in oversize flat tops and "domed ends" celluloid models, pen profiles not offered in vintage Waterman Ideals, another high quality pens and awesome flexy writer. 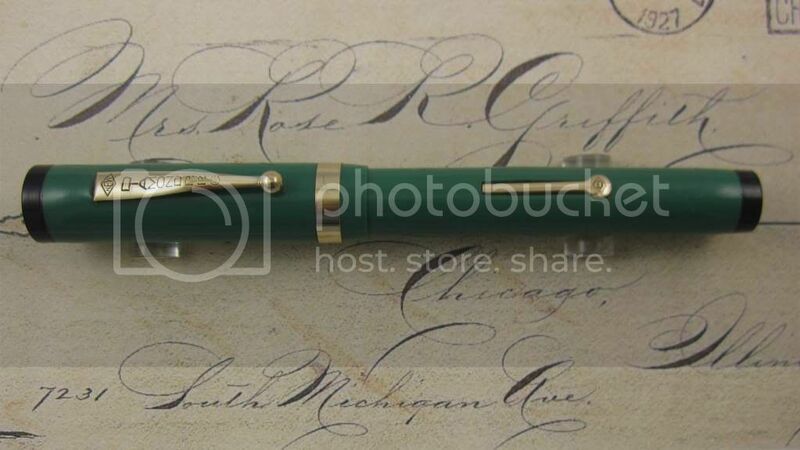 Beautiful writing sample and pictures of your wood grain Diamond Point pen. Thanks for your kind words. I really enjoy FPN, but people like Leo and Tipstricks made my visits to this wonderful forum a lot more pleasant. How nice is to befriend and acquiant with other pen enthusiasts from all over the world. Anyone and everyone who has a diamond point and wants to share pictures, their own reviews are more than welcomed to help expand this review anytime ! 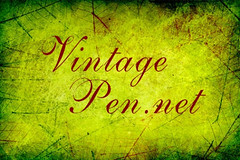 Thanks for allowing me to add some pictures and extra historical information about our beloved vintage Diamond Point fountain pens. 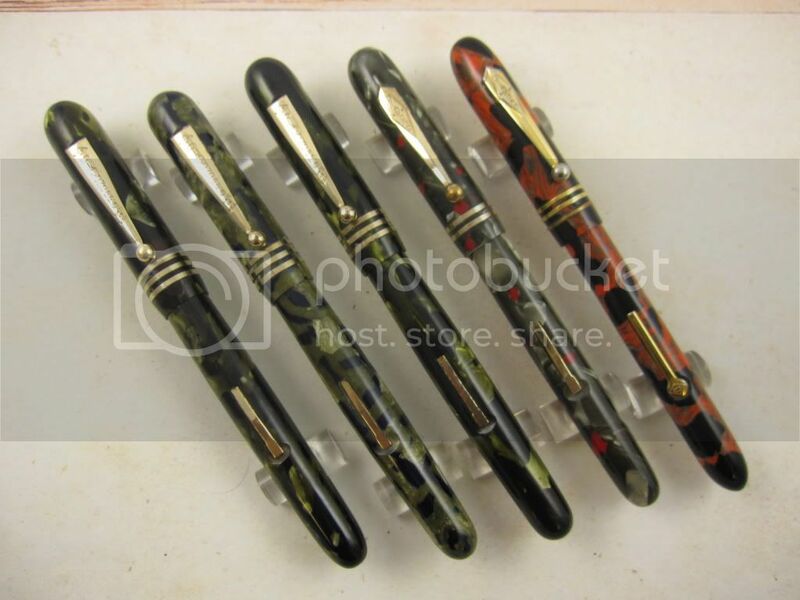 The following pictures represent samples of Diamond Point pens from my personal collection and pens I owned and sold through my pen website. 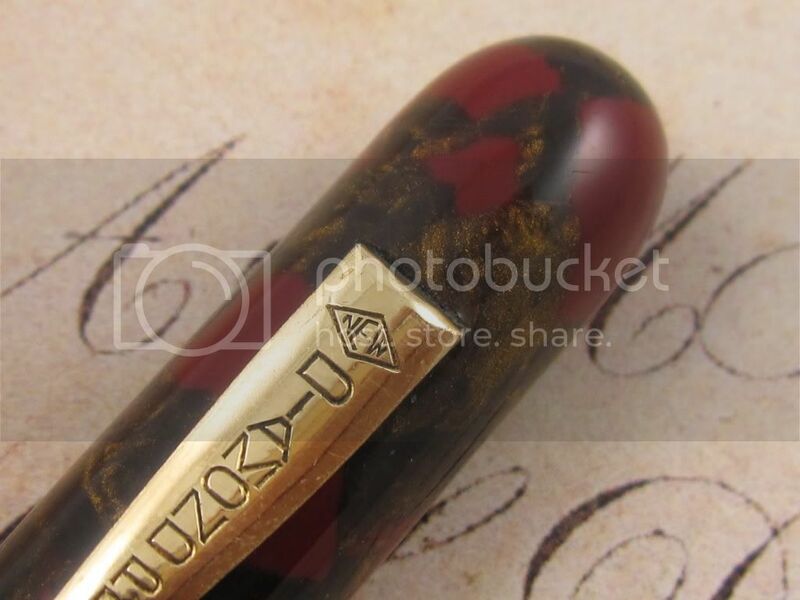 There is very little information available on Diamond Point pens, and my main intention to post this information is to share my very limited and humble knowledge of this fountain pen brand. 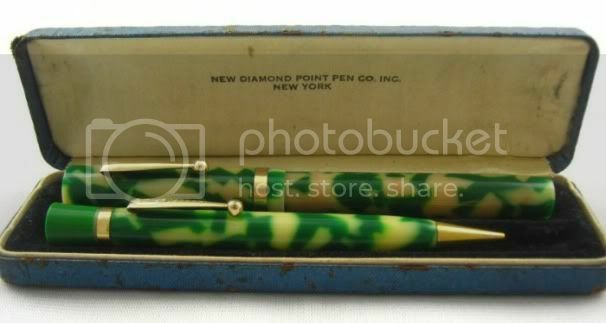 My second purpose is to make a clear statement that Diamond Point indeed made a significant amount of tier-1 fountain pens, mostly during the 1920s and 1930s. It is heart-breaking to read statements indicating all Diamond Point pens are tier-2 or tier-3 pens. The upcoming pictures will help anyone make his or her own conclusion. 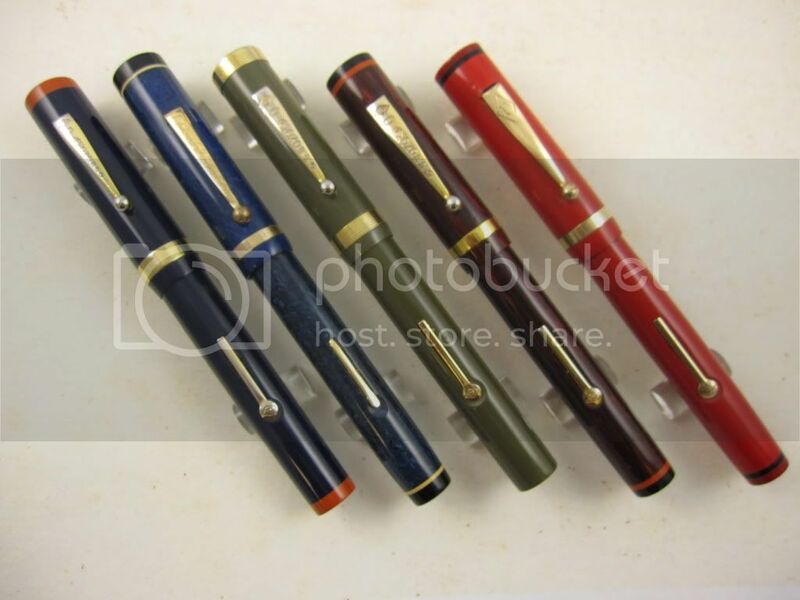 As a referential point to that era, Waterman pens dominated the pen market during 1900-1927 and until Parker pens launched the Duofold, the iconic pen model that changed the dynamics of the pen market place, both in market share for pen makers and in fountain pen design, features, feeding systems, available colors, etc. I am not an expert on Diamond Point pens. I am just a humble collector and user who gets lots of funs from Diamond Point pens. 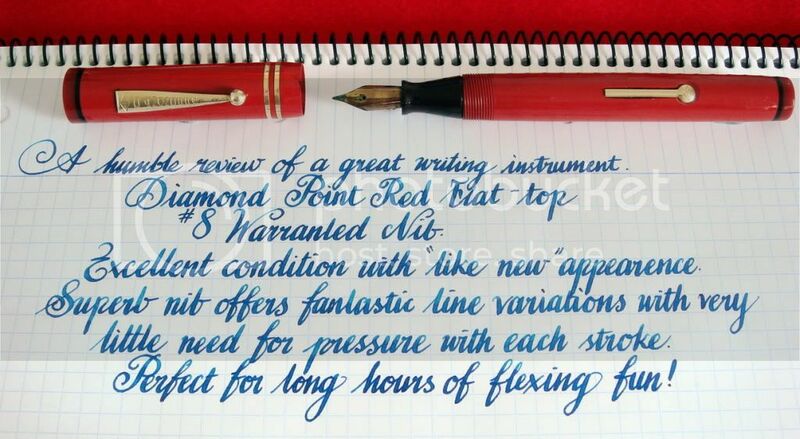 I like their designs, colors and writing capabilities with their flexible nibs (not available in all models) of DPs. A Diamond Point pen deserves the credit (or blame!) 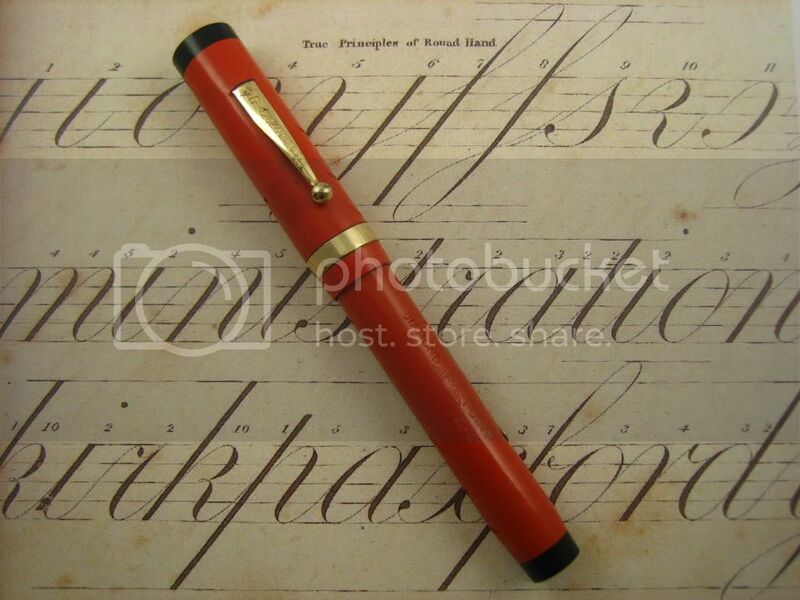 as being the first fountain pen that got me hooked into flexible writing. Prior to year 1920, they named and imprinted their pens, packaging and marketing materials as "Diamond Point"
A very significant amount of Diamond Point pens were fitted with 14K Warranted flexible nibs and another significant amount came with 14K Diamond Point flexible nibs. Pens 3 & 4 above have super flex "wet noodles" and two of my nicest flexy wirters ... 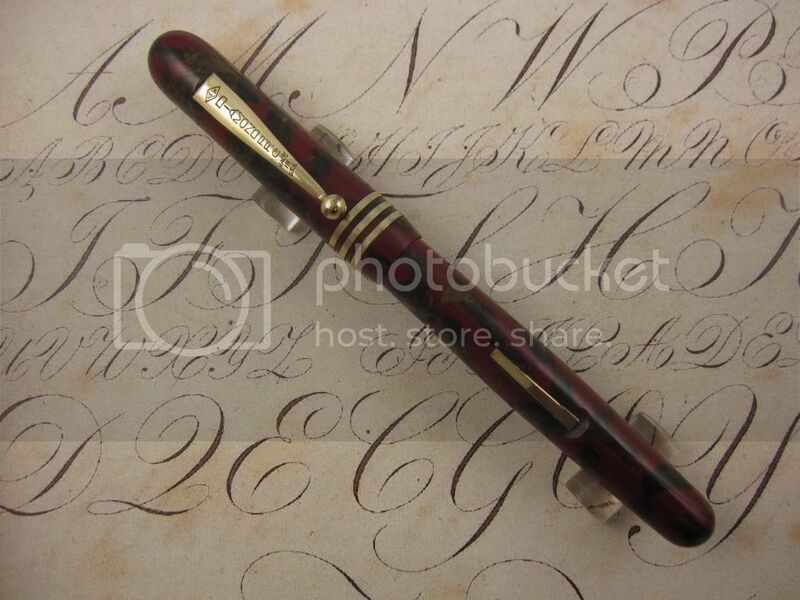 Writing samples and pictures of the nibs will come at a later time! 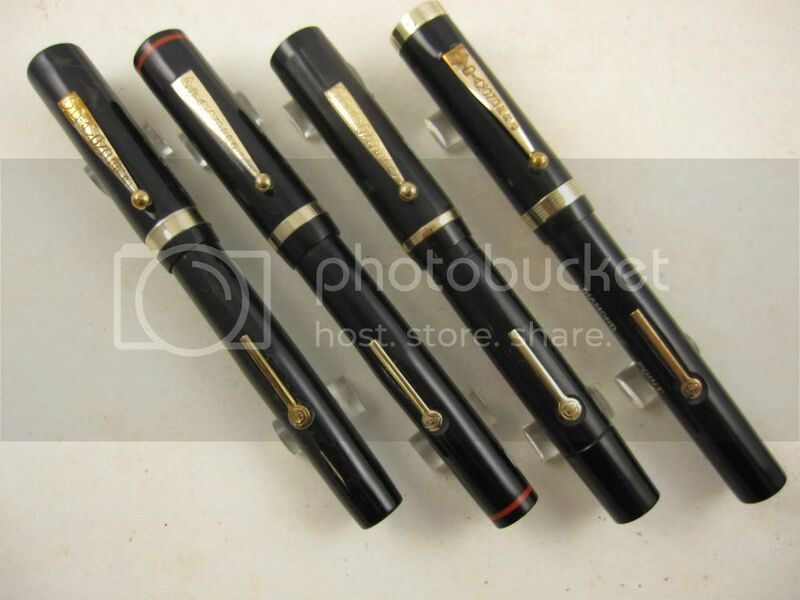 All four of these pens have smooth exterior finish (no chasing) and are oversized flat-tops, wider in diameter (girth) than a Parker Duofold Sr. These are perhaps the most common Diamond Point pens or at least the ones I see the most. Please notice the vast array of vibrant colors available while the competition at the time mainly offered black, lapis blue, "red", jade green and perhaps a few more colors. ... I am leaving the nicest one to be the last in this segment. This is a Diamond Point boxed set. 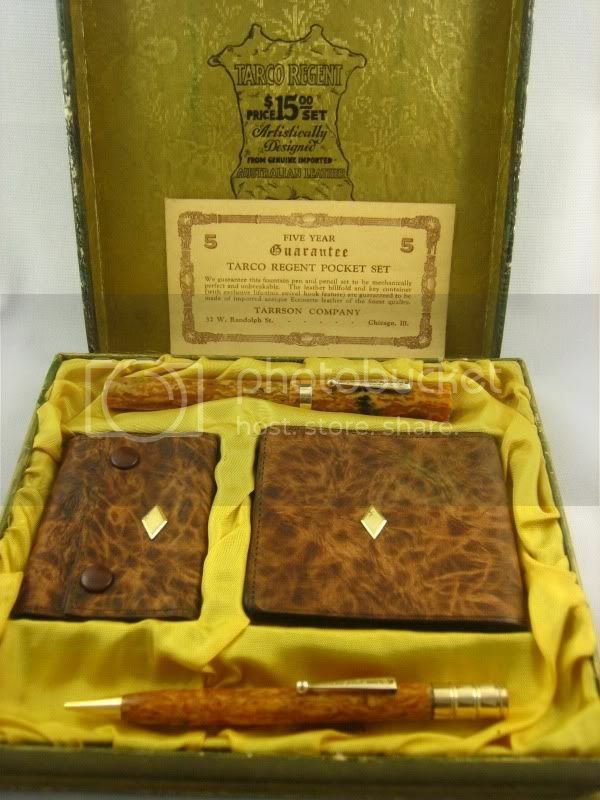 The set includes the fountain pen in marbled amber color with gold tirm, matching pencil with a gold crown on the cap, accompanied by Australian leather wallets with its distinctive "Diamond" metal emblem encrusted in the leather. The box itself is a high quality pen box with gold satin and very elegant floral patterns in golden materials on the interior and exterior of the box. Very impressive pen set. Have only seen one of this so far! 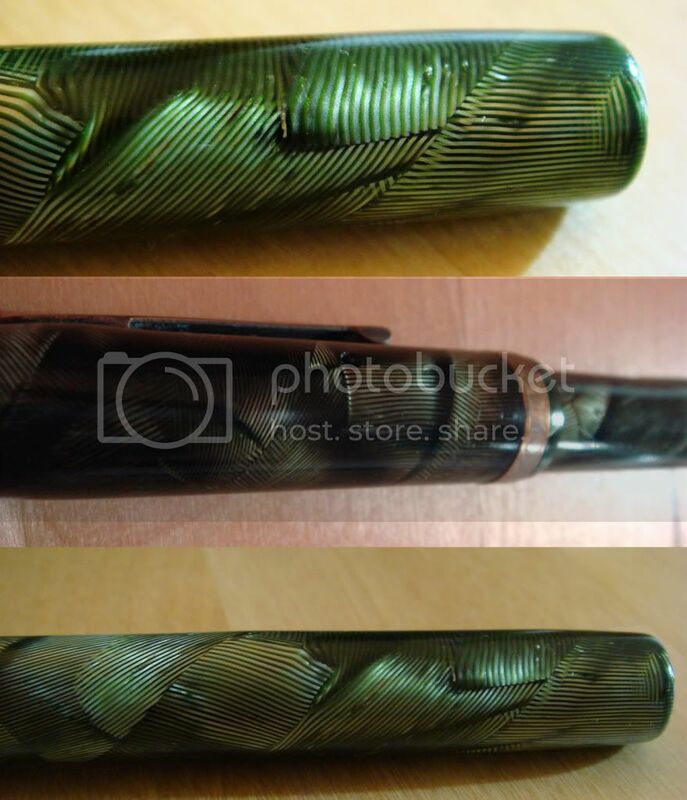 This model has "domed" ends or cigar shapes, common in Conklin Crescent and previous models of Mabie Todd, Swan, and other pen makers. 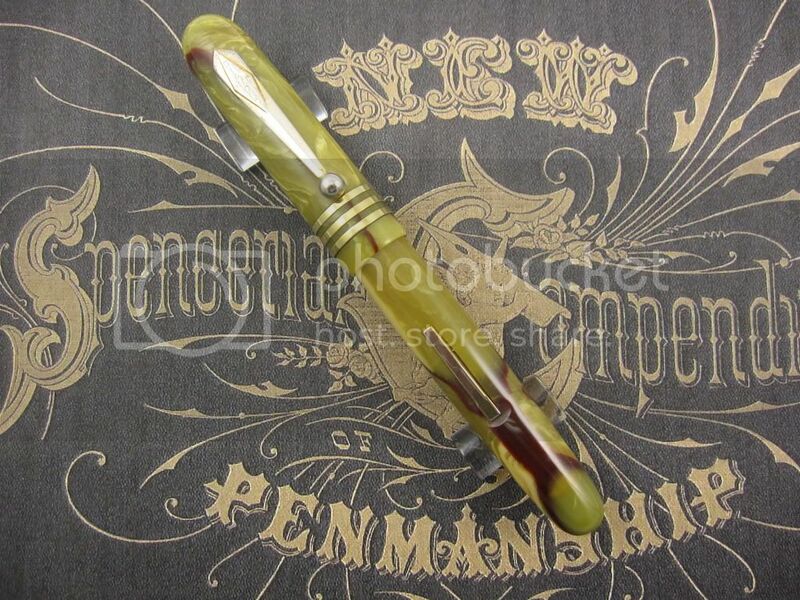 The uniqueness of Diamond Point is they used celluloid materials and made these pens in mottled or marbled colors, leaving some gorgeous color patterns in a very nice pen design. 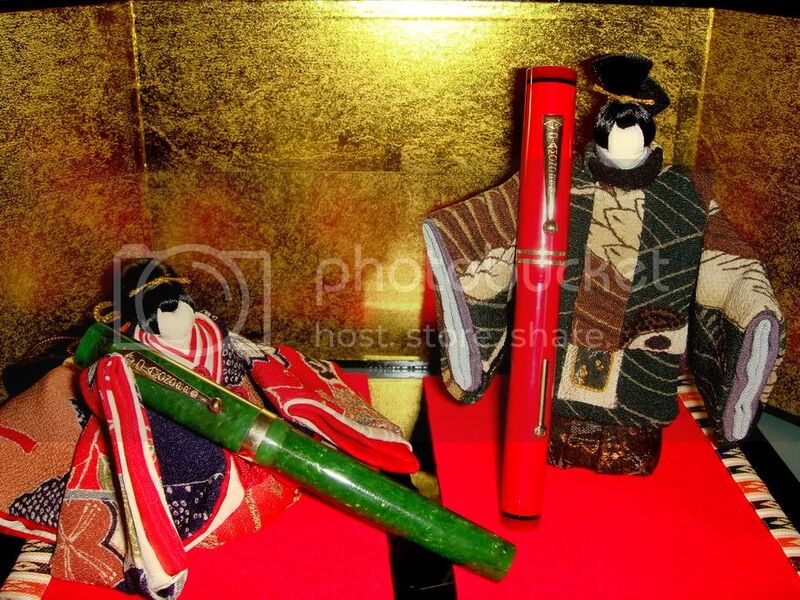 The following three pictures belong to the first Diamond Point pen I acquired. It is this pen that got my mind (as well as my arms, hands and fingers!!!) spinning in all different directions as I was trying to figure out how to write with a flexible nib. 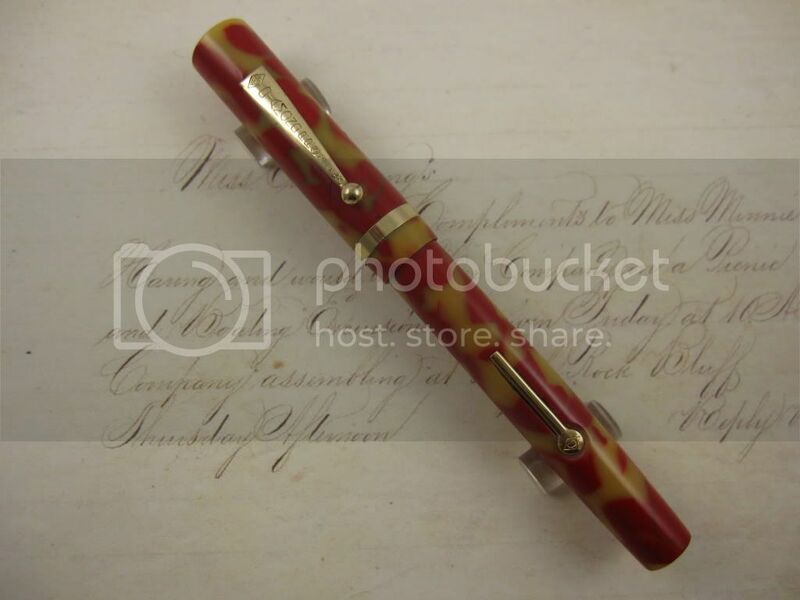 It has a semiflex fine to broad and it has a magnificent red and brown/copper marbled celluloid with gold trim. It measured 5 3/*" long (capped). Needless to say, I have fond memories of this pen ... and the adventure into flexible writing started from this pen up to this day. 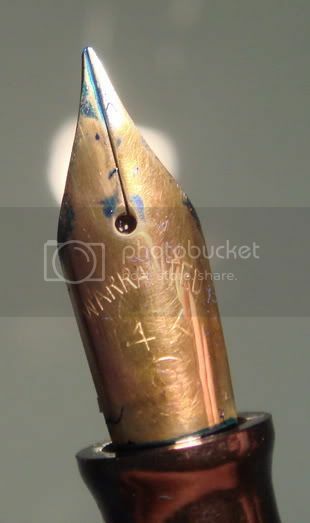 It is just never ending pleasure in my opinion, allowing the pen user to take a fountain pen and its nib to the ultimate degree of writing satisfaction and performance!!! The following two pictures are Demi models, measuring 4 1/2" in length (capped). 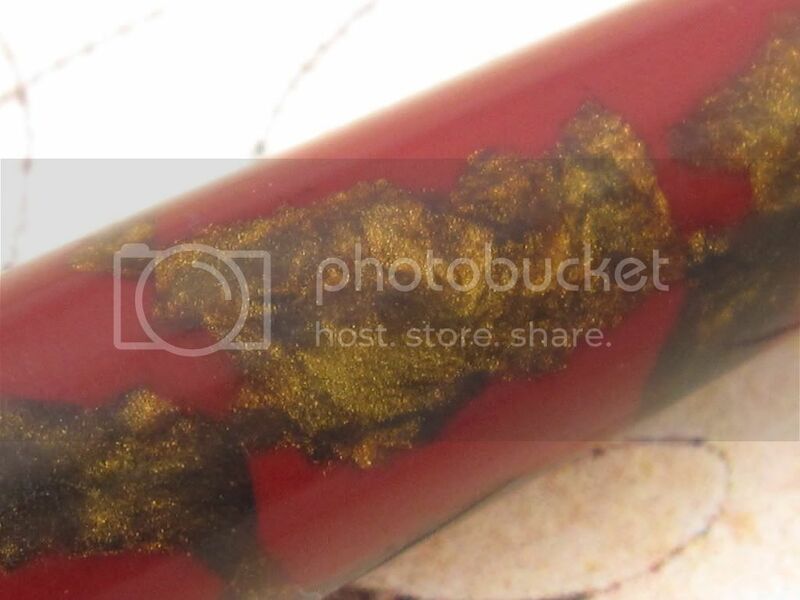 The marbled amber/moss with red and white veins in another gorgeous color pattern as well. Their colors tend to oxidize quite a bit. This sample has very little oxidation. 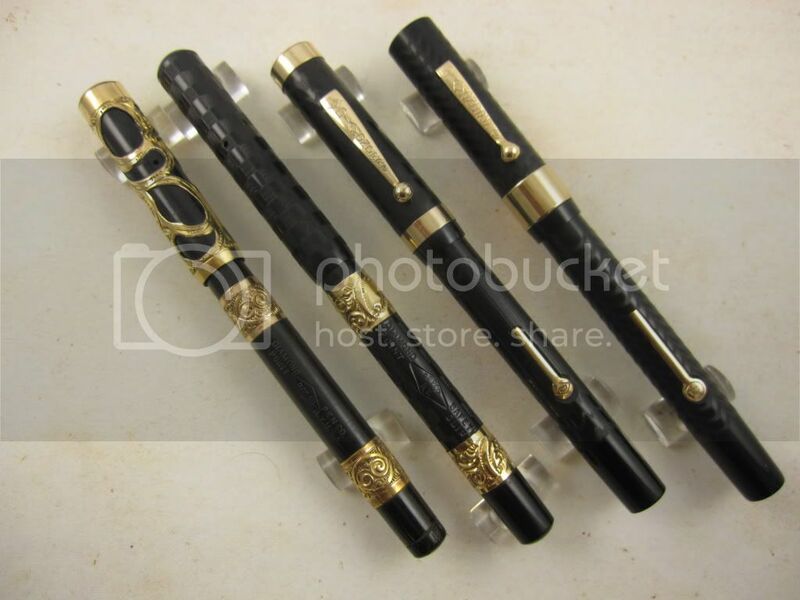 It is my desire that one day you decide to give a chance to a vintage Diamond Point pen and that one of these beauties gives you as much writing pleasure as they have done to me. 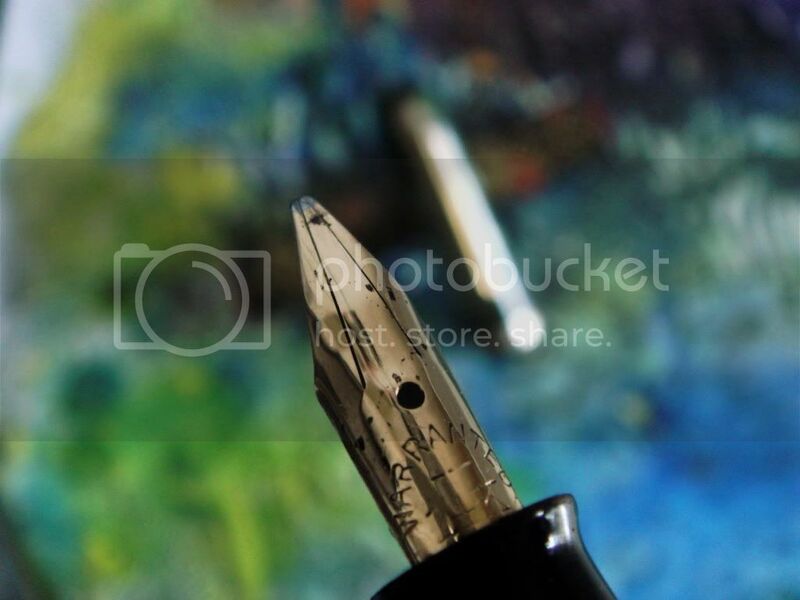 More nib pictures and writing samples at a later time. 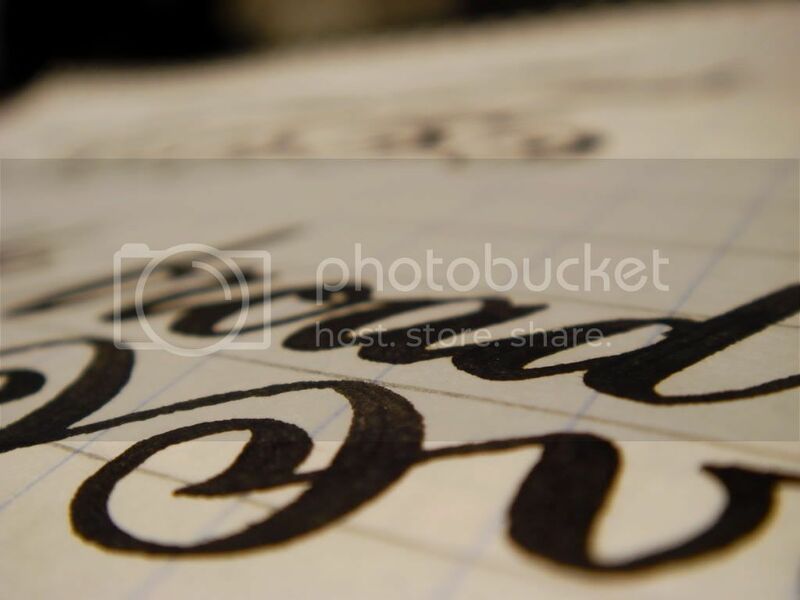 Happy writings! Edited by Mauricio, 20 March 2010 - 09:16. Many thanks for your added contribution !! I wasnt aware there were so many different beautiful designs ! Edited by Apotheosis, 20 March 2010 - 18:47. I bought mine from Mauricio too without knowing much from this pen and I am not sorry I did; I am sorry I have NOT bought many more!! Mauricio, your collection is very desirable! Leo, that is a very nice pen, I have the slimmer version of it. Any other Diamond Point owners out there want to share their pictures and opinions ? Those are really wonderful pens. Thanks for the reviews and pictures. 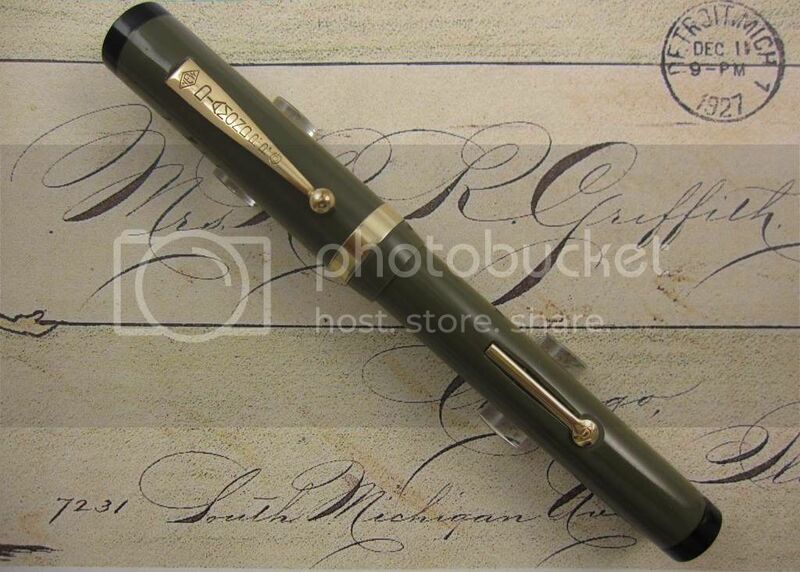 Here's another addition to my inventory..a demi sized Diamond Point Green Celluliod with a vintage music nib ! Edited by Apotheosis, 26 April 2010 - 16:32. 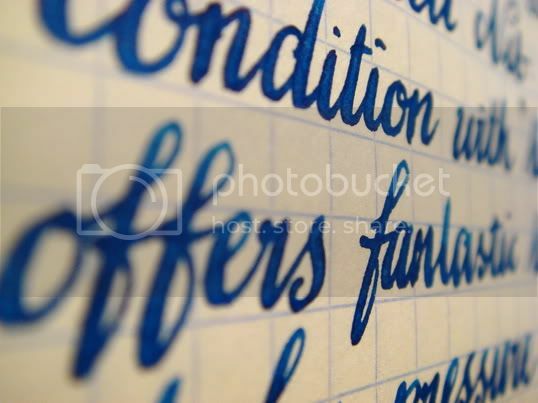 What absolutely stunning handwriting! Fabulous!